Diamond Guide: Leiser & Co.
Leiser & Co. prides itself on offering its clients diamonds of the very best quality and at the most competitive prices. Diamonds come in many shapes, sizes and quality and knowing some basics before you make the investment will help you understand your investments long term value and help you choose the right one. Carat is the weight measurement of diamonds. The metric carat, abbreviated "ct" equals 1/142 oz. (0.200 gram), it is the standard unit of weight for diamonds and most other gems. If other factors are equal, the more a stone weights, the more valuable it is. Large diamonds are obviously rarer than small ones, so large diamonds cost much more per carat. We have included a brief guideline for comparing carat weight to millimetres. In this example, we use round excellent cut diamonds. Differences in the diamond shape, depth and cut of a specific stone will mean significant variations from these sample measurements. The most important attribute on which a diamond is valued is its colour composition. Generally speaking, the clearer the diamond is, the more it is worth. An alphabetical scale from D through Z is used to express the range of a colour that’s based on a combination of tone (darkness or lightness) and saturation (intensity). The combination is called depth of colour, and it’s a measure of how noticeable a colour is. The diamonds that ranges from colourless to light yellow and brown fall within the normal colour range. Within the normal colour range, colourless diamonds are the rarest, so they’re the most valuable. Subtle differences in colour can dramatically affect the value of a diamond. Two diamonds of the same clarity, weight and cut can differ in value based on colour alone. Even the slightest hint of colour can make a dramatic difference in value. Imagine two glasses of water -- one clear, the other containing a few drops of lemonade -- and you will begin to get an idea of the differences in diamond colour grades. Once the colour composition moves beyond Z, or has a completely different hue than yellow, brown or grey, it then becomes a fancy coloured diamond. Fancy coloured diamonds are graded on how much colour composition it has and how strong its composition is. Fancy coloured diamonds come in almost any colour you can imagine. Red, green, purple and orange are generally the rarest, followed by pink and blue. Yellows and browns are the most common fancy colours. Grading fancy colour diamonds is complex and specialized, and it takes highly trained laboratory graders to complete the process accurately. Another factor that affects a diamond’s apparent colour is the colour of the mounting itself. Yellow gold makes slight amounts of yellow or brown less obvious, while white metal mountings make the colour in yellow or brown diamonds more apparent. On the other hand, white metals enhance the appearance of colourless stones. Diamond clarity, as the term suggests, indicates the level of inclusions and blemishes that the diamond has. Inclusions are enclosed within a diamond. They might also extend into the diamond from the surface. Blemishes are confined to the diamond’s surface. Together, inclusions and blemishes are called clarity characteristics. Clarity characteristics can help establish a diamond’s identity and quality. The fewer inclusions and blemishes it has, the more rare the diamond is and the greater its value. A small, seemingly insignificant clarity characteristic can make a difference of thousands of dollars in the value of a diamond. 3 crucial factors determine the overall effect of characteristics on a clarity grade. Most of them have to do with how readily the grader can see the characteristics. The three factors are: Size, Number and Position.The effect of size is obvious, larger inclusions affect clarity more than small ones. The number of inclusions is also important, but its not just a matter of counting inclusions. A stone can have many tiny inclusions and still be high on the clarity scale. One or two of the largest inclusions usually set the grade. An inclusion’s position also affects its visibility. Inclusions are much more visible right under the table than they are under the bezel facets or near the girdle. FL (flawless): No inclusions or blemishes of any kind are visible inside or outside the diamond under 10-power magnification. 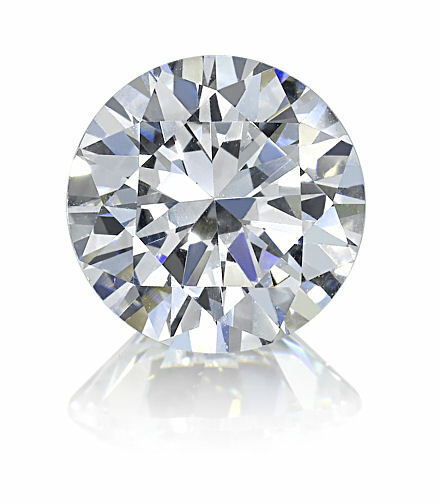 IF (internally flawless): Diamond has no internal inclusions seen under 10-power magnification but has some external or surface blemishes such as a miniscule scratch. VVS-1 & 2 (very, very slightly included): Diamond with inclusions so minute that even a trained gemologist has significant difficulty seeing them in the diamond under 10-power magnification. VS-1 & 2 (very slightly included): Diamond has minor inclusions which are moderately difficult to see under 10-power magnification. SI-1 & 2 (slightly included): Diamond has inclusions somewhat noticeable with 10-power magnification but extremely difficult to see without magnification. I-1, 2 & 3 (included): Diamonds that fall in the I range contain inclusions that are obvious under 10-power magnification, usually the inclusions are noticeable without magnification. In some cases the inclusions affect transparency and brilliance. A polished diamond’s cut is divided into proportion and finish. A diamond’s proportions are its angles and relative measurements and the relationships between them. The basic choices a cutter makes when fashioning a diamond include the size of the table, the crown and pavilion angles and girdle thickness. Other factors indicate the care the polisher used when finishing it. These include the symmetry of the facets and their relationship to one another as well as the fineness of the polish. These elements all contribute to a diamond overall appearance. Proportions are the size and angle relationships between the facets and different parts of the stone. Proportion affect how a diamond "scintillates" or shines because it affects how light is reflected and refracted inside the stone, which is what causes diamonds to sparkle. Each part of a diamond makes its own contribution to the diamond’s appearance. The table facet gathers light from above and either reflects it back or directs it into the diamond’s interior. The crown facets gather and disperse light to create fire. The pavilion facets take the light that comes in through the crown and direct it back out to the viewer’s eye. The girdle makes an important contribution of its own by providing a location for the diamond to be secured into a setting. All of a diamonds proportions will be measured and compared with industry-consented benchmarks and then be graded individually according to how much a stone’s proportions measurements vary from the agreed standards. The lowest cut grade will set the grade. The cut grade will be graded on a scale from excellent to poor. The Cut grade is an important parameter in the round brilliant diamond grading report, but it isn’t used in the other shapes grading reports. The fancy diamond grading reports don’t a have a cut grade. Finish is made up of polish and symmetry. Polish is the overall condition of the diamond’s facet surfaces it describes how well light enters and exits the facets of the diamond. Polish can be a result of the finishing process or be affected by blemishes created after cutting. There are certain polish characteristics frequently seen on diamonds. There might be traces left by the polishing wheel or from polishing too fast or against a polishing direction. Polish is graded on a scale from excellent to poor. Excellent: Ranges from no polish features to a few minute features that can be located with difficulty under 10X magnification. Very Good: A few minor features when viewed under 10X magnification. Good: Areas of noticeable features when viewed under 10X magnification. The Might slightly affect luster when seen by the unaided eye. Fair: Areas of obvious, heavy features when viewed under 10X magnification. Affects luster when seen by the unaided eye. Poor: Areas of prominent, heavy features when viewed under 10X magnification. Significantly affects luster when seen by the unaided eye. Symmetry refers to the evenness of a diamond’s outline, the exactness of the shape and placement of the facets. Most diamonds have a least a few symmetry variations, but they typically have little effect on appearance, at least to the unaided eye. Symmetry is graded on a scale from excellent to poor. Excellent: Ranges from no symmetry variations to minute variations that can be viewed with difficulty under 10X magnification. Very Good: Minor symmetry variations seen under 10X magnification. Good: Noticeable symmetry variations seen under 10X magnification. The diamond’s overall appearance might be slightly affected when viewed with the unaided eye. Fair: Obvious symmetry variations seen under 10X magnification. The diamond’s overall appearance is often affected when viewed with the unaided eye. Poor: Prominent symmetry variations seen under 10X magnification. The diamond’s overall appearance is significantly affected when viewed with the unaided eye. The modern round brilliant has a round girdle outline, symmetrically placed triangular and kite-shaped facets, a table that’s larger than 50 percent of the girdle diameter, and a small culet or none at all. More than 500 years of experimentation led to the introduction of the modern round brilliant cut in the early 1900’s. Its intricate proportions showcase a diamond’s brilliance and fire with dazzling effectiveness. The round brilliant still remains the dominant diamond cut in the marketplace today. The other diamond cuts are called fancy shapes. Many diamonds emit light, or glow, when they’re exposed to ultra violet (UV) radiation. This is called fluorescence and its caused by an interaction between the UV radiation’s energy and the diamond’s atoms. A diamond’s degree of fluorescence doesn’t necessarily affect its appearance in most lighting situations, it will only be noticeable under the concentrated longwave ultraviolet radiation of a UV lamp. About one-third of gem-quality will emit some degree of fluorescence. On the laboratory diamond grading reports, the fluorescence entry is a description, not a grade. The terms for describing fluorescence are NONE, FAINT, MEDIUM, STRONG, VERY STRONG. Most of the diamonds that fluoresce do so in varying strengths of blue, however, diamonds can fluoresce in almost any color. Intercontinental Diamond Company only sells diamond graded & certified by the most reputable gemological laboratories, the GIA, HRD, IGI laboratories. Gemological laboratories grade hundreds of thousands of diamonds a year. That much repetition makes the grades on the diamond reports highly reliable and consistent. Another factor that contributes to the accuracy of the grades is that several graders examine each diamond. A quality report from any of those laboratories allows anybody to choose a diamond without seeing it. A report can also work the other way: you can check a diamond that’s accompanied by a quality report to make sure it matches its description. This protects you against switched stones. Established in 1931, the Gemological Institute of America (GIA) is the world’s foremost authority on diamonds, colored stones, and pearls. The Hoge Raad voor Diamant (HRD)’s primary shareholder is the Antwerp World Diamond Centre (AWDC). The AWDC is a private foundation established in 1973 as (HRD) or Diamond High Council and represents the Belgian diamond industry. Over more than 30 years, HRD Antwerp has gained the diamond industry’s confidence by offering high-quality solutions, a highly reputable lab, as well as massive in-house expertise and experience. HRD Antwerp offers a wide range of services and equipment geared for the use of diamond and jewellery professionals as well as for the diamond and jewellery buying public. The International Gemological Institute (IGI)., was founded in 1975 and along with its sister laboratories is one of the leading gemological institutions worldwide.